Adding a new element to the rich learning experiences it provides for children and their families, the Forest Lake Family Center in Forest Lake, Minnesota, has created a certified Nature Explore Classroom to enhance its Early Childhood Family Education program. 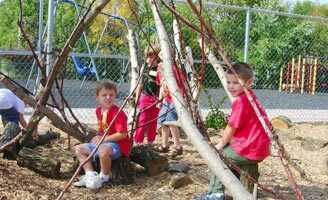 This new outdoor space officially opened on October 11, 2007 and is the first Certified Nature Explore Classroom to be constructed in Minnesota and sixth to be certified in the nation. Creating with Messy Materials in the Nature Explore Classroom, children at Forest Lake Family Center have direct contact with nature while gaining a sense of accomplishment. Striving to create strong families and healthy, well-developed children, the Center serves a diverse cross-section of families with young children in the community. The Nature Explore Classroom has helped the Center expand its educational offerings with a nature-education element that is benefitting children and families. Nature Explore principles are also being incorporated into parent education curriculum in sessions like the ‘Leave No Child Inside’ class, designed for parents of children ages 0 to 8 years. The Forest Lake Family Center Nature Explore Classroom is situated in a redesigned area of the grounds surrounding the Center. The Classroom includes a building area, nature art table, messy materials area, and a climb/crawl/balance area that includes a crawl-through log. 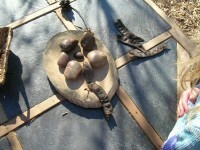 In addition, a large movement and music area offers an akambira where children can practice their music and rhythm skills. Children develop artistic skills while experiencing the textures and colors of nature in the Nature Art Area of the Center’s certified Nature Explore Classroom. 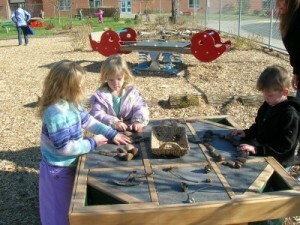 Activity areas are separated using a variety of surfaces, such as grass, mulch, and paver blocks. Willow fencing is used in the music/gathering area. Newly installed hedging surrounds the messy materials area, and logs are used to define the art area. Small hills are very popular with the youngest children. Master gardeners in the community helped transform the area into a lush, nature-filled space by assisting the Center in selecting appropriate trees, grasses, flowering plants, and other foliage. Plants were chosen for durability and low maintenance, and parent volunteers dug in and helped in the planting. Children can explore their musical talent while playing an akambira in the Music and Movement Area of Forest Lake Family Center’s certified Nature Explore Classroom. Children explore nature and create three-dimensional masterpieces like this one in the Nature Art Area of the Center’s certified Nature Explore Classroom. -Climbing ivy was planted along chain link fencing to give it a more natural look. -All plantings are low enough to allow adults to see all areas in the space at all times. -A loom made from birch branches and fabric is incorporated into the entry area. -The Family Center’s Parent Advisory Council provided a beautiful paver sunburst design in the entry area. -The Council also helped promote the Nature Explore Classroom in the community.